…of ice cubes dropping into the ice bin! 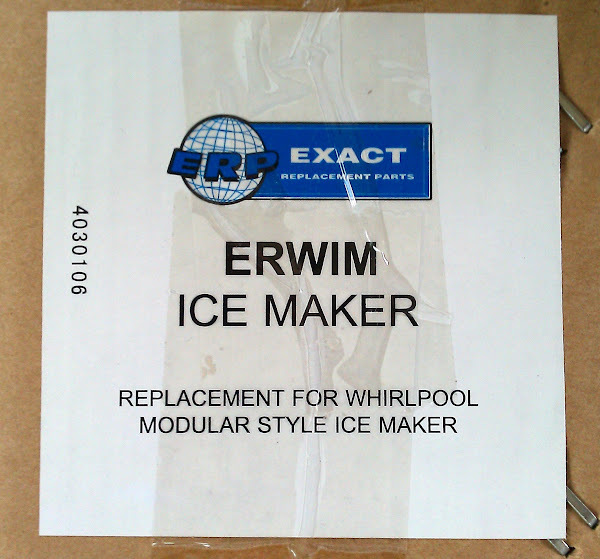 Woohoo, the icemaker is back in business! The replacement module arrived Thursday mid day as expected. It should have been a five minute deal to reinstall it, but as Murphy would have it the top two mounting screw holes were stripped and the screws couldn’t be re-tightened properly, so it took about an hour of finagling around, moving stuff out of the freezer again and generally making a mess before the installation was completed. 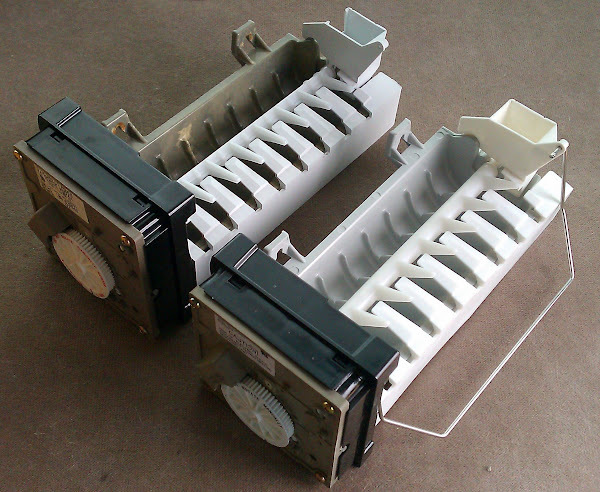 The new unit is nearly identical to the old with some minor design differences in some of the plastic parts. It also has yet another part ID – see the photo at right (in all photos the new unit is on the right). 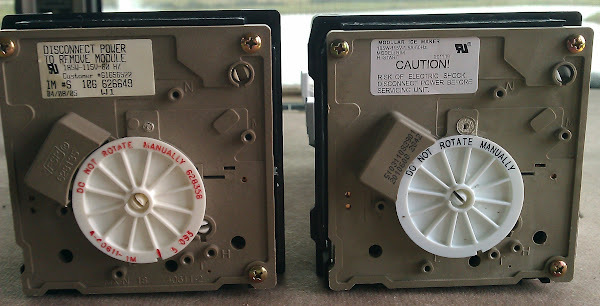 Oh and BTW, this replacement unit came complete with the shut off arm – some of the others I found online required that you use your old one. I did have to reuse the lower mounting bracket and of course the wiring harness. 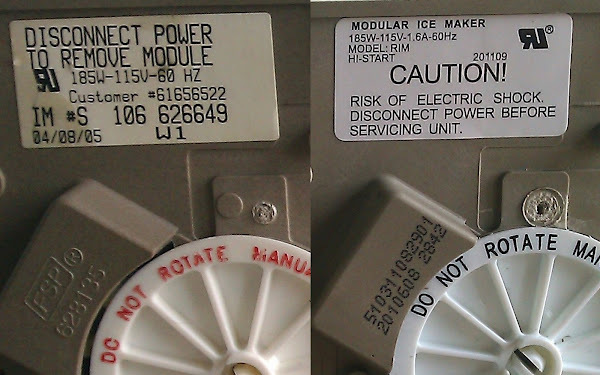 So after everything went backed together I plugged in the icemaker circuit and voila – nothing happened! Well, this is normal – the mechanism has a temp sensor attached to the mold – and in series with the power – that basically keeps the system from operating until the mold reaches a certain [low] temperature. 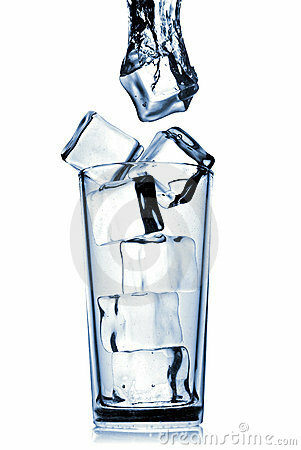 That’s how it determines when to start a new cycle, dump the frozen cubes and add some fresh water. The fresh water raises the temp of the mold and stops the works until the cubes refreeze, etc. So anyway, I was sweating it out at first because it took over 8 hours before the mold cooled down, a cycle started and the mold filled with water. Whew! Then it was a couple more hours before the first batch of cubes were generated (which I threw out for sanitary reasons). Meanwhile, for fun (yeah I know) I took the old icemaker apart and re-measured the resistance of the heater coil – it read normal. Uh-oh what’s going on here? it was dead open yesterday. Best I can figure is a flaky contact or an intermittent connection and/or the temp sensor (aka “bi-metal”) was bad. In any case, the old unit didn’t work, the new one does and the boss is happy. Thankfully this crisis has been handled and cocktail hour(s) can resume. I was concerned for you!